Updated 12-02-10. Vegetarian pho, or phở chay, has never been about healthy eating in Vietnam. Of course there are people who must go the vegetarian way due to health or personal belief reasons, but for the majority of the population, pho chay, and other chay foods, are more about observing strict non-meat meals as part of the Buddhist religious observance. Now with pho being quite popular in the U.S. and the population becoming more conscious about leading a healthy lifestyle, it's only natural that restaurants offer vegetarian pho or pho chay on their menus. 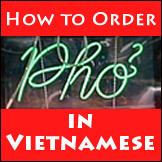 Pho is the well-known Vietnamese rice noodle dish. The authentic version has its broth made using beef or chicken bones, then served together with various kinds of beef or chicken meats. The noodle dish is essentially a meat-based dish. In the words of Asian cookbook author Corinne Trang, pho is really two separate dishes in one: the broth, and the noodle with its ingredients. 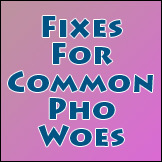 It would take good skills and experience to create imitation pho, which is exactly what vegetarian pho is. A vegetarian pho, or “pho chay,” can be vegetarian on at least 2 levels. I'm a purist so, to me, vegetarian means absolutely no meat. For many of my American friends, however, vegetarian might mean no meat, but seafood is okay. 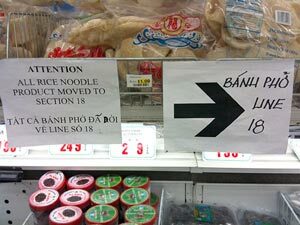 You can find both varieties at pho restaurants in the U.S. 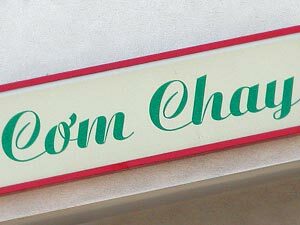 If in doubt, ask the restaurateur of what's actually in their pho chay. Or alternatively, you can find more authentic vegan dishes at strictly vegetarian restaurants, which are popping up like mushrooms around Little Saigon in CA, as well as other Little Saigons around the world too. A real and completely vegetarian pho is made entirely from vegetables. Instead of using meats and bones, the broth depends entirely on vegetable ingredients such as leeks, wheat gluten (mock beef, chicken, etc.,) tofu and mushrooms for flavors and textures. 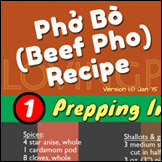 Important pho ingredients are definitely retained to keep the pho flavors, and as long as they are not meat-based. 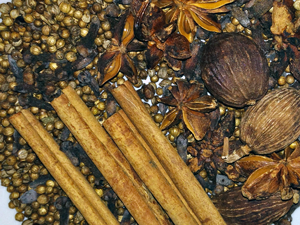 These include onion, star anise, cinnamon, ginger, cloves, and the likes. Vegan or not, pho would not be pho without these ingredients to give pho its unique aroma. For devoted Buddhists, some root vegetables like onion and garlic may also be excluded. If you have a chance to try vegetarian foods served at a Buddhist temple, you'll notice that it's a lot simpler and may taste bland to the common person. The point is it has nothing to do with enjoying a meal at the temple (hardly the proper place to look for culinary nirvana, but definitely a place to find culinary creativity,) but everything to do with knowing you have a meal without killing an animal. Temple chay foods are true vegetarian and healthy, but once vegan foods get to the restaurants, chefs spice things up to make it more attractive to paying customers. Most vegan dishes at these places are quite good to eat, and many are really excellent. Vegetarian pho or pho chay will never be as popular as pho bo and pho ga, but when done right, it's an excellent vegan choice. 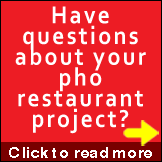 Share your favorite pho chay restaurant experience with us in the comment below. Thanks for covering pho chay! Now I know what it’s called. 🙂 Not many places order it but it’s definitely my dish of choice when I can find it! 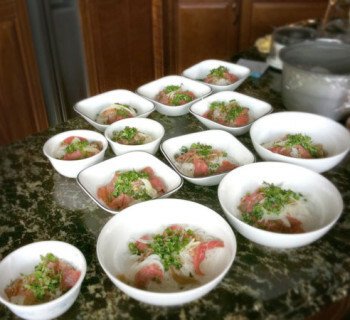 @Kerry: Good pho chay is very easy to make, and much cheaper than either beef and chicken pho. But many restaurants simply do not want to deal with it, hence you have versions that range all over the place in terms of quality. If customers know that they can get consistent and delicious pho chay, I’m sure pho chay sales can rival beef and chicken pho any day. We do this everyday at our restaurant Ui-Cha! Pho on the campus of the University of Montana, Missoula. Thanks for leaving a comment Kerry. I just wanted to mention there is a pho place in Raleigh, NC called Pho Far East that has INCREDIBLE vegetarian pho. A family owns it and the mother/grandmother actually makes her own faux meat with embedded peppercorns to add protein to the soup in addition to the tofu. I haven’t seen that addition anywhere else and it is positively dreamy. If you ever get down to Raleigh, I encourage you to check out the vegetarian pho at Pho Far East! The best I’ve ever had– and I’ve had quite a bit. @Elizabeth Welch: Thanks for sharing. Pho Far East has some decent Yelp reviews too. Sounds like a winner.